Major Groups > Gilled Mushrooms > Pale-Spored > Lactarius > Lactarius "rubidus"
Lactarius rubidus Methven nom. prov. 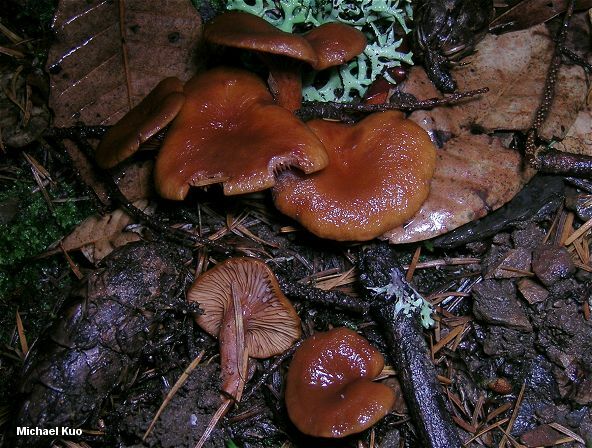 For years this West-Coast species passed as Lactarius camphoratus and as a variety of the eastern species Lactarius fragilis, despite substantial differences. 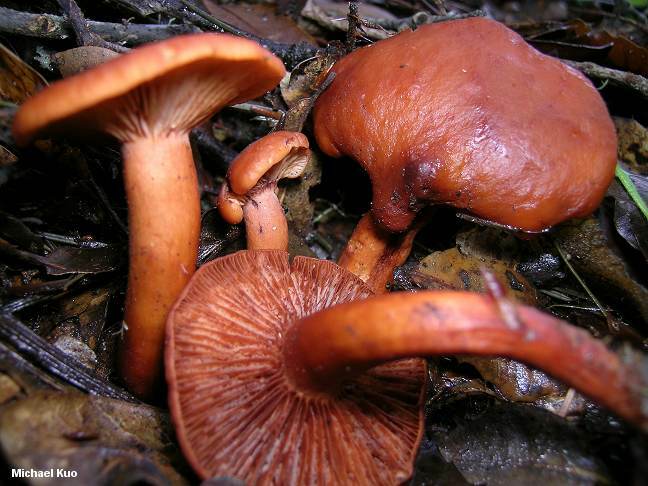 While Lactarius rubidus does have the characteristic burned-sugar odor of this species complex, it is larger and redder than the other species; it also has waterier (say that three times fast), scantier milk and differs on microscopic features (see below). 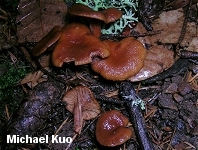 Methven (1997) promoted Hesler & Smith's Lactarius fragilis var. rubidus to the level of species, but the species name is provisional according to the rules of taxonomy since a type collection was not designated and a Latin diagnosis was not provided. Ecology: Mycorrhizal with oaks (coast live oak and tanoak) and with Douglas-fir; growing alone, scattered, gregariously, or in loose clusters; fall and winter; on the West Coast. Cap: 2-8 cm; convex, becoming flat or shallowly vase-shaped; dry or sticky; somewhat wrinkled or uneven, but otherwise smooth; reddish brown to orangish brown. 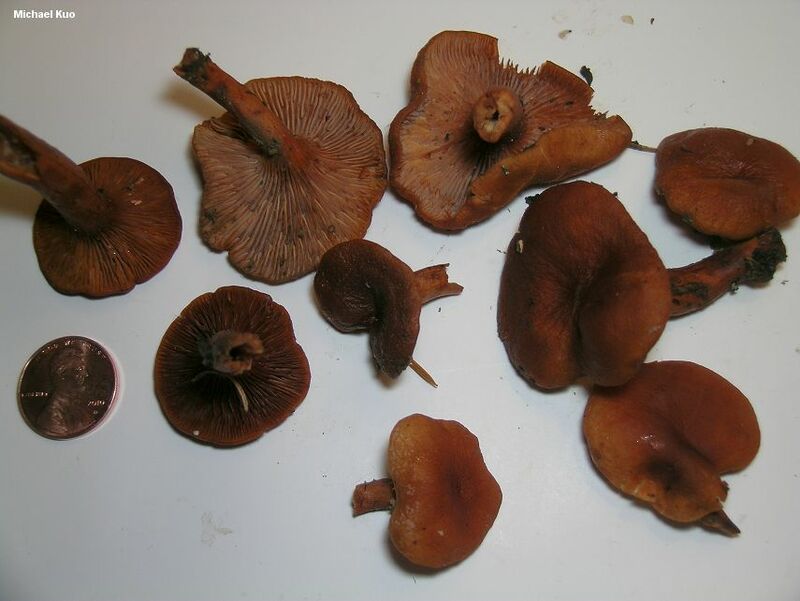 Gills: Attached to the stem or running slightly down it; close or nearly distant; very pale orange, developing cinnamon stains and discolorations but not staining from the milk. Stem: 2-7 cm long; up to 1.5 cm thick; colored like the cap or paler; more or less equal; smooth; without pot-holes; often with orangish fuzz at the base. Flesh: Very pale orange; not staining when sliced. Milk: Watery or whey-like; not copious; not staining tissues. Odor and Taste: Odor like maple syrup or burned sugar, becoming stronger when the mushroom is dried; taste mild. 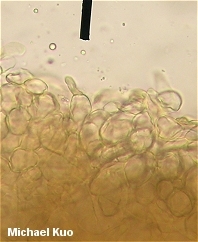 Spore Print: Pale yellow or whitish. Chemical Reactions: KOH on cap negative. 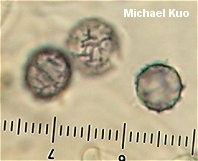 Microscopic Features: Spores 6-8 µ; round or nearly so; ornamentation 0.5-1.0 µ high, as amyloid warts and connectors forming partial reticula. Macrocystidia absent. Pileipellis a hyphoepithelium. REFERENCES: (Hesler & Smith, 1979) Methven, 1997. (Arora, 1986; Methven, 1997; Kuo, 2007.) Herb. Kuo 02200309, 01130522, 01131106.